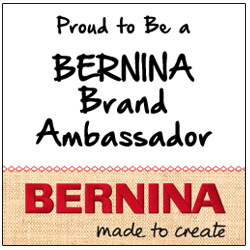 Thank you for your interest in my work and signing up to receive my quarterly newsletter! Many of you know that I consider myself a “lucky lizard.” I love lizards, rocks and petroglyphs. 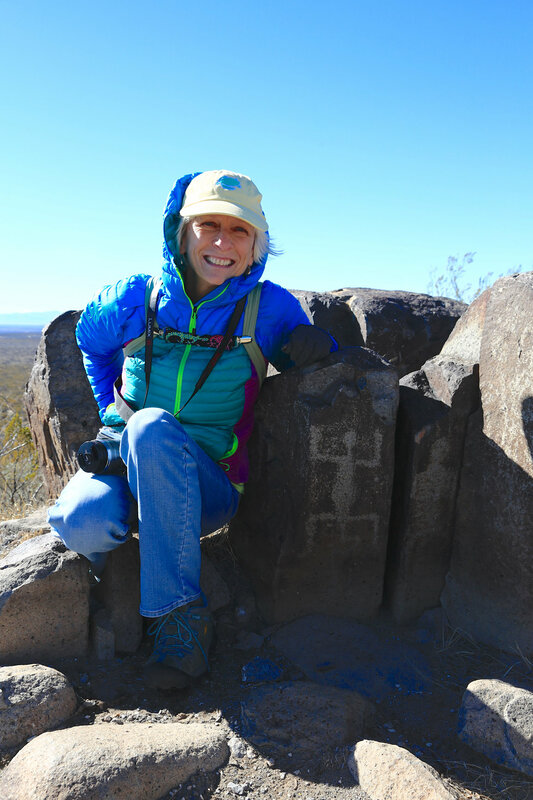 Here I am with a lizard petroglyph in the Three Rivers Petroglyph Site in New Mexico, which has an amazing collection of over 22,000 petroglyphs! 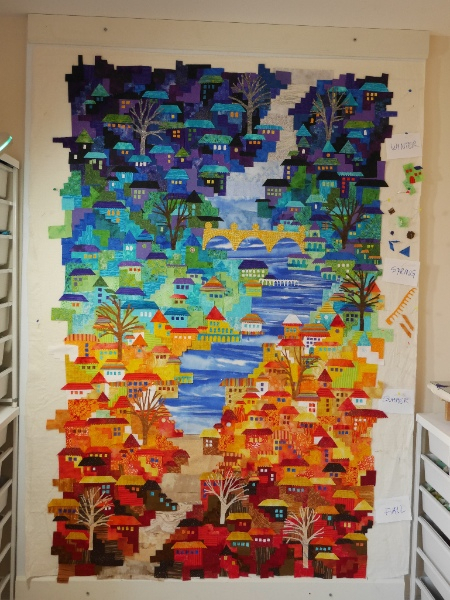 After a workshop in Albuquerque with the wonderful quilters of the New Mexico Quilters Association, my husband and I enjoyed a mini vacation in New Mexico and Texas. The beautiful scenery and bright colors will continue to inspire me for this coming year. 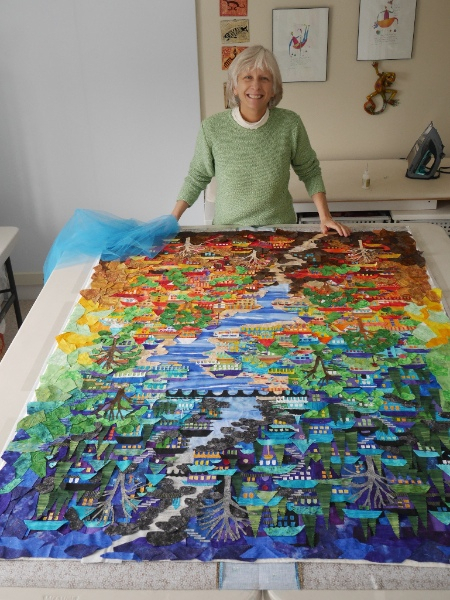 I started this Happy Village on November 22, 2016 and am just now finishing with the quilting (mid February). 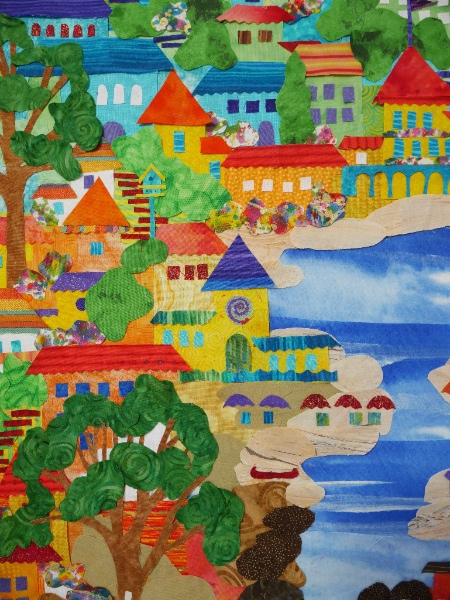 The idea was to create a village that gradated from Winter to Spring to Summer to Fall in colors and values. The trees would also change for each season….bare trees in Winter, new foliage in Spring, full foliage in Summer then the colorful leaves of Fall. This is by far the largest village I have made. It was quite a challenge! 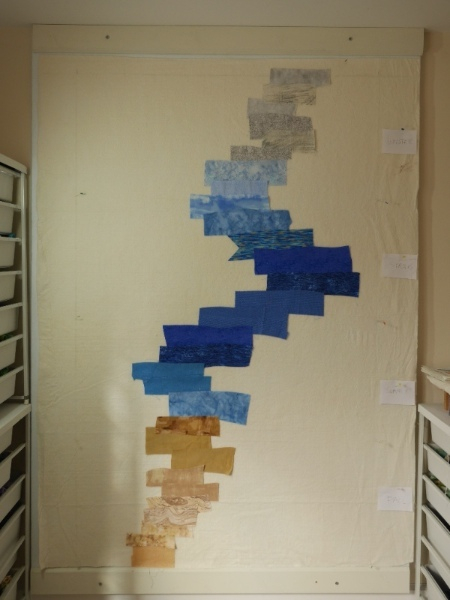 First, the river was collaged with horizontal strips…..ice to blue river to sandy path. 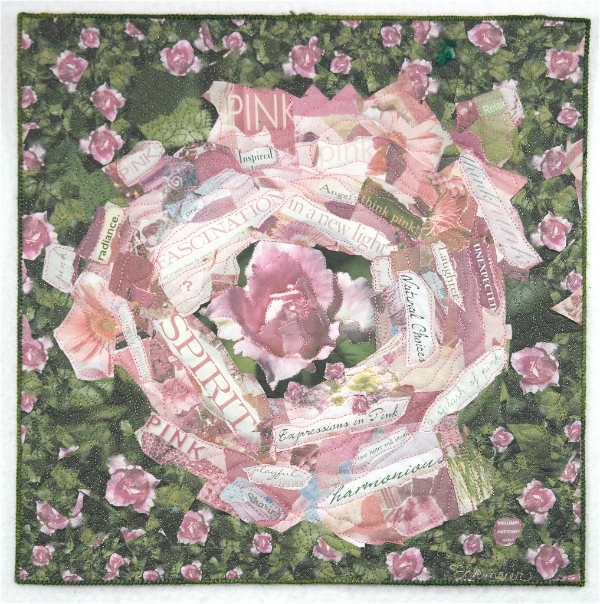 are collaged by season, value and color. It doesn’t look like a village yet! Third, the roof tops are added. It’s starting to look a little bit like a village now. Fourth, windows and doors are added. Fifth, added three trees for each season. The Spring, Summer and Fall trees will get leaves. Notice the yellow bridge….. it got replaced by a smaller black bridge. Such a major demolition project, yet the reconstruction process was so easy in fabric!! Fun with the details. 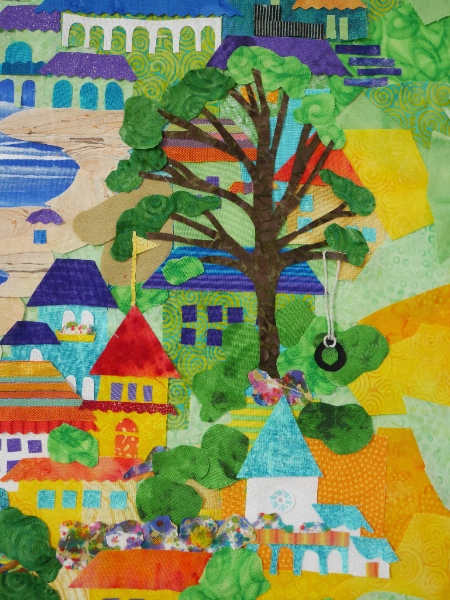 Birdhouses, a lizard weathervane, tire swing, red canoe, beach umbrellas, etc. Getting ready to lay down the tulle (very fine netting) to cover the entire surface. Thread basting and quilting are next. 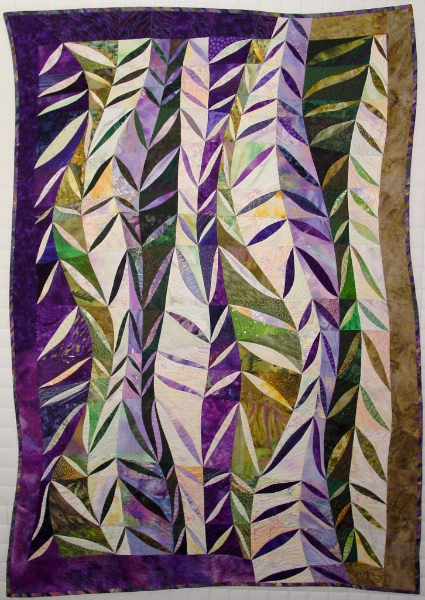 Since I’m still working on this piece, you can see the finished quilt with details of the quilting in the Spring newsletter. 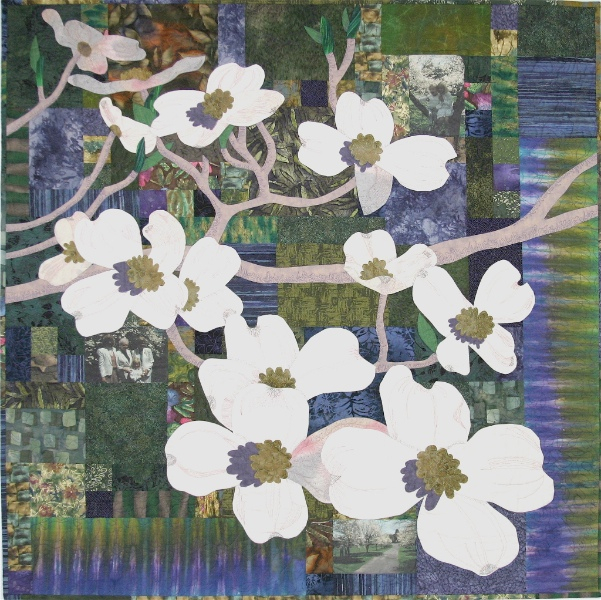 To welcome Spring I have chosen 17 of my quilts that were inspired by the garden or nature. 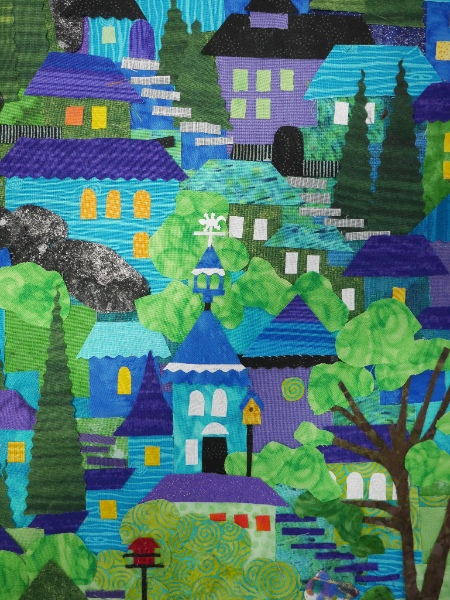 The quilts range in time from 1999 to 2015 and range in techniques from hand applique, photo transfer, curved piecing, raw edge collage, my layered topstitching technique and couched yarn applique. If you live in the area, please stop by and view the exhibit, which will include an ongoing digital slide presentation of my work in the Brown Room. 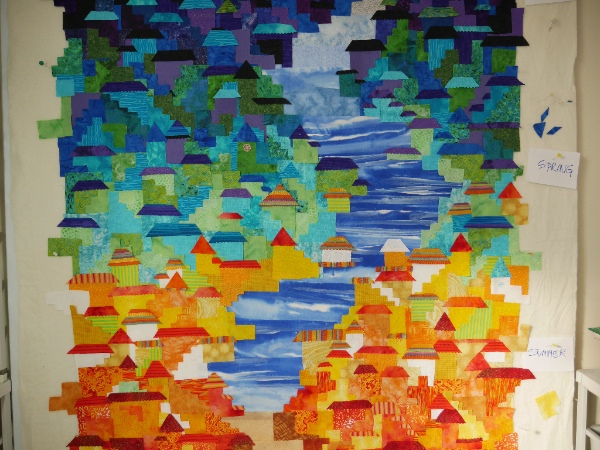 Positive Energy #5 (For Sale) - (2012 -40” x 54”) layered topstitch piecing technique with color tissue paper sun prints. 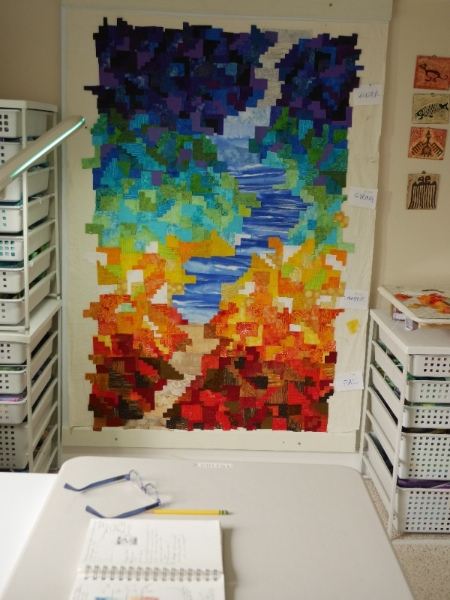 Here is a sneak peek of three other quilts that will be on display in the exhibit. The New Year started out with a trip to New Mexico in January to teach a Happy Villages workshop in Albuquerque. 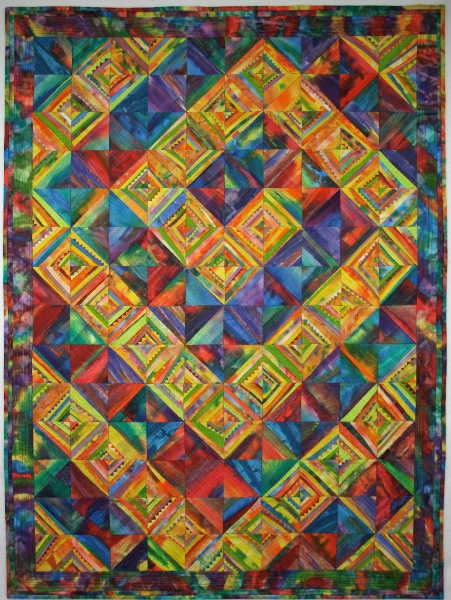 Soon I will be on my way to Virginia to teach at the Mid-Atlantic Quilt Festival in Hampton. I look forward to meeting you (or seeing you again!) at one of these venues. If you are interested in attending one of these workshops, please contact the guild or organization to get prices and registration information. If you need help contacting one of the venues, just let me know and I would be happy to give you the name of my contact person. 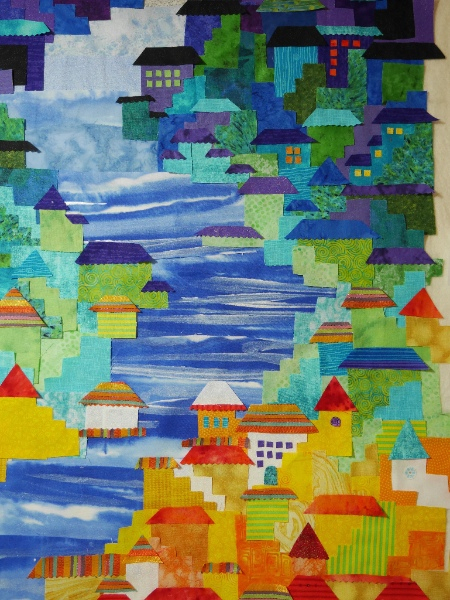 Wiltwyck Quilter’s Guild, Lake Katrine, NY April 8 (Happy Villages & Accidental Landscapes AM lecture and Layered Log Cabin PM 3 Hour workshop)….and again on May 20 for Quilted Vest workshop. 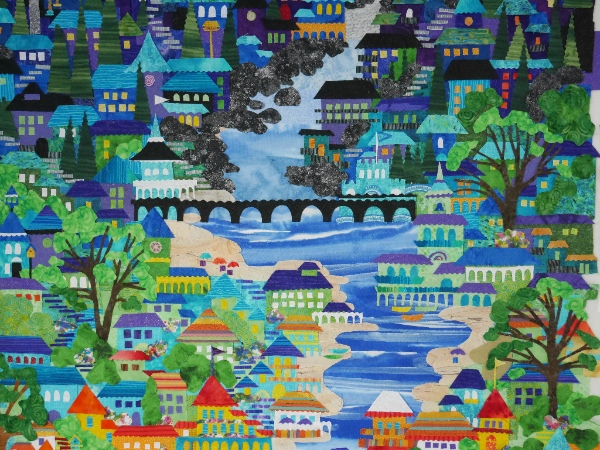 Faithful Circle Quilters, Columbia, MD Oct 7-9: 10/7 Scrappy Layered Log Cabin workshop, 10/8 Happy Villages, 10/9 Eve. Still Makin’ Waves lecture. 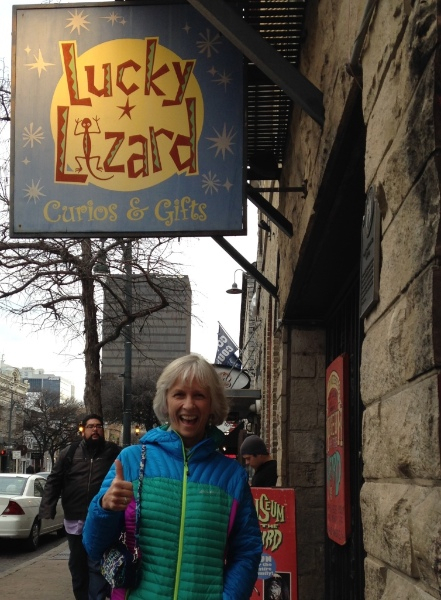 The lucky lizard finds a Lucky Lizard store in Austin, Texas!!! All the best to you until our creative paths cross in the future! 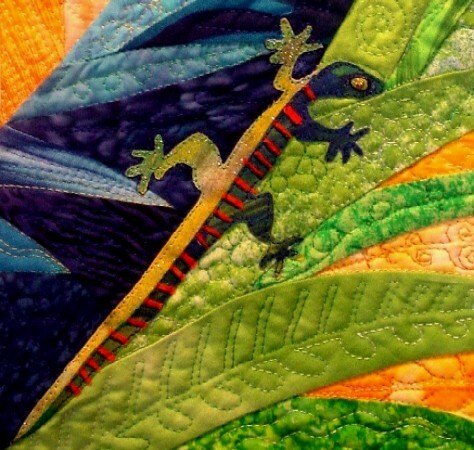 Copyright © 2017 The Quilted Lizard Fiber Art Studio, All rights reserved.